So…. I’ve been thinking a lot about hope the past few days. Perhaps you saw my post on the thing with feathers that perches in the soul? A little Emily Dickinson there for ya. There were two reasons for this. One was the conference that I went to with the Apple of my Eye. 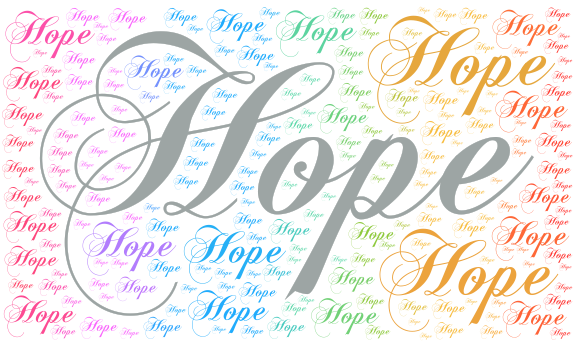 The theme was on hope, so of course I found myself pondering the topic relentlessly for a few days. The beautiful thing was that while the teachings were about the concept of hope ~ faith, expectation, promise… they were also about the Lord, in that He is hope. It was intriguing to think of hope not in the sense of the feeling we have, but in terms of the reason for the feeling. The other reason my mind was so on Hope was that our kitty was missing. For 24 hours, while my husband and I were gone, the kids and my folks and our neighbors were combing the neighborhood for our frightened, skittish, runaway cat. I was a few states east, and helpless. So I prayed, and I hoped. Hope is more than just a wish. We generally use the word “hopeful” to mean we want something to happen, but we’re not sure it will. But biblically speaking, what it really means is to wait expectantly. There’s a confidence and trust that is not inherent in the world’s definition, and it changes everything. They found the cat. I didn’t know if that would happen, but I was hopeful. But no matter how it turned out, I was sure that that any suffering my kids and I were experiencing in our anxiety was nothing when compared to the beauty of God’s plan for us. Of that, I have full hope.